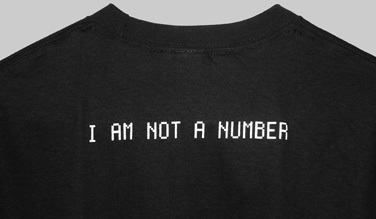 "I AM NOT A NUMBER" printed on back. Tired of the shirt on your back being appropriated for advertising? HELLO my barcode is graphic silkscreen printed on 100% cotton t-shirt. Available in men's sizes Small to 2X-Large, and a variety of girl's fitted sizes. In stock and ready to ship today. Sizes chart is WIDTH X LENGTH. 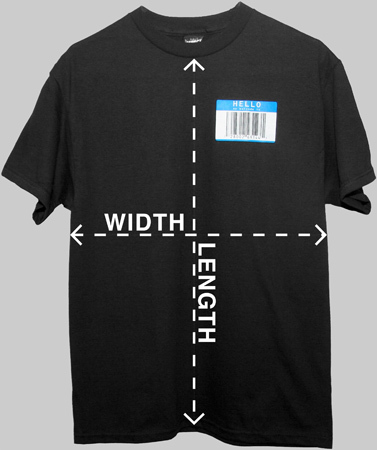 Width is measured across the chest. Length is measured from collar to hem. Personalize this barcode t-shirt with your name, birthday, or any other saying up to 17 characters long. Letters, numbers, and spaces are acceptable for the custom phrase. The barcode image is digitally printed directly on 100% cotton shirts. Available in men's sizes Small to 2X-Large. 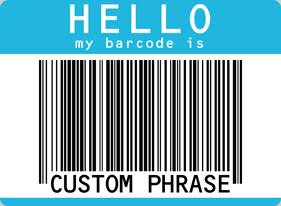 *Custom barcode designs take one week to manufacture.